The MemCAD project aims at designing a framework for the static analysis of programs manipulating complex memory states. A very wide range of data structures are encountered in real programs, such as arrays, linked structures, strings... While static analysis techniques have been developped to deal with each of those issues, no framework allows to deal with all of them in a single analysis tool. The purpose of the MemCAD project is to propose ways to combine analysis techniques adapted to simpler data structures so as to infer precise invariants about programs manipulating complex data structures, composed of intricate combinations of basic ones. silhouettes for the guiding of unions of abstract states. The current version of the MemCAD Analyzer is available in Opam. See here for the package description. macros modifying the table dynamically. The industrialization of tools for the verification of Spreadsheet Applications is the focus of MatrixLead, a startup created by Tie Cheng (Tie Cheng serves as CEO of MatrixLead, and Xavier Rival as Scientific Adviser). Xavier Rival, CR1 INRIA Paris Rocquencourt, Abstraction Project Team, PI. Bor-Yuh Evan Chang, Assistant Professor at the University of Colorado at Boulder at ENS Paris. Hugo Illous, PhD Student at CEA and ENS Paris, co-supervised with Matthieu Lemerre. Huisong Li, PhD Student at ENS Paris. Jiangchao Liu, PhD Student at ENS Paris. Tie Cheng, former PhD Student at ENS Paris (graduated in September 2015). Arlen Cox, former PhD Student at University of Colorado at Boulder and ENS Paris, co-advised with Bor-Yuh Evan Chang (graduated in November 2014). Pascal Sotin, Post Doc at ENS Paris (2011-2012), now Assistant Professor (Maìtre de Conférences) at IRIT and IUT Blagnac. 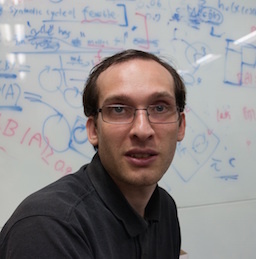 Arnaud Spiwack, Post-Doc at Inria/ENS Paris, from September 2012 to August 2014. Antoine Toubhans, PhD Student at ENS Paris, from October 2011 until December 2015. Pippijn Van Steenhoeven, Research Engineer, now Engineer at Google. A Relational Shape Abstract Domain. Hugo Illous, Matthieu Lemerre and Xavier Rival. In Nasa Formal Methods Symposium (NFM'17) . Semantic-Directed Clumping of Disjunctive Abstract States, ACM Symposium on Principles of Programming Languages (POPL 2017), 2017 Huisong Li, Francois Berenger, Bor-Yuh Evan Chang and Xavier Rival. In Principles Of Programming Languages 2017 (POPL'17), Paris, Jan. 2017 . (VM). Desynchronized Multi-State Abstractions for Open Programs in Dynamic Languages. Arlen Cox, Bor-Yuh Evan Chang and Xavier Rival. In European Symposium On Programming (ESOP'15) , London (UK), April 2015. [.pdf] (to appear). Static Analysis of Spreadsheet Applications for the Detection of Type Unsafe Operations. Tie Cheng and Xavier Rival, In European Symposium On Programming (ESOP'15) , London (UK), April 2015. [.pdf] (to appear). Abstraction of Arrays Based on Non-Contiguous Partitions. Jiangchao Liu and Xavier Rival, In Conference on Verification, Model Checking and Abstract Interpretation (VMCAI'15) , Mumbai (India), January 2015, Lecture Notes in Computer Science 8931, pages 375--395, Springer. [.pdf]. Construction of Abstract Domains for Heterogeneous Properties. Antoine Toubhans, Bor-Yuh Evan Chang and Xavier Rival, In International Symposium On Leveraging Applications of Formal Methods, Verification and Validation (ISOLA'14) , Corfu (Greece), October 2014, Lecture Notes in Computer Science 8803, pages 489--492, Springer. [.pdf]. Automatic Analysis of Open Objects in Dynamic Language Programs. Arlen Cox, Bor-Yuh Evan Chang and Xavier Rival, In Static Analysis Symposium (SAS'14) , Muenchen (Germany), September 2014, Lecture Notes in Computer Science 8723, pages 285--301, Springer. [.pdf]. An Abstract Domain Combinator for Separately Conjoining Memory Abstractions. Antoine Toubhans, Bor-Yuh Evan Chang and Xavier Rival, In Static Analysis Symposium (SAS'14) , Muenchen (Germany), September 2014, Lecture Notes in Computer Science 8723, pages 285--301, Springer. [.pdf]. Modular Construction of Shape-Numeric Analyzers. Bor-Yuh Evan Chang and Xavier Rival, In Festschrift for Dave Schmidt, Manhattan (Kansas, USA) , September 2013, Electronic Proceedings in Theoretical Computer Science 129, pages 161--185, EPTCS. [.pdf].